With a reputation of being fun to drive and advanced technology, the Eclipse sports car was one of Mitsubishi’s best-selling and iconic vehicles ever. Now, the Eclipse moniker is making its jubilant comeback with the same reputation for driving dynamics and technology in the form of a CUV, the all-new 2018 Eclipse Cross. The Eclipse Cross is a fusion of sharp coupe looks and dynamic SUV mobility with signature Mitsubishi styling, technology and driving confidence. A compact CUV, the Eclipse Cross will join the Outlander Sport and Outlander to form a formidable CUV lineup for Mitsubishi. The Eclipse Cross contains many all-new features including a 1.5-liter direct-injection turbo- engine, dual-pane, power-sliding panoramic roof, 7-inch smartphone link thin display audio with touchpad controller, Head-Up Display (HUD), heated rear seats and the launch of MITSUBISHI CONNECT. “On your marks. Get set. Go.” A common phrase familiar to those who compete in track and field or recognizable while watching the Olympics, this phrase is given to start every running race. The inspiration for the exterior styling of the all-new Eclipse Cross is that of a runner in the “Get Set” position. They are crouched down in their lane and on their mark, muscles are defined, energy evident and movement is dynamic. Watching a runner in the set position is highly anticipatory, and such is the emotion while looking at the Eclipse Cross. Similarly, the Eclipse Cross’ coupe form is distinguished by: its wedge profile with distinctive beltline and strong character line; a forward raked rear window; the angular rear gate and short overhang; and beefy fenders projecting the image of a powerful athlete. The front of the Eclipse Cross features Mitsubishi’s signature DYNAMIC SHIELD front design concept. The concept is a protective shield shape visually formed by the black central area represented by a black radiator grille that hints to the performance of the car. The black area is embraced from three directions – the left, right, and bottom. DYNAMIC SHIELD emphasizes the front end’s functionalities aimed at protecting both people and the car itself. The dynamic and characteristic rear design is distinguished by the almost cubist styling created around the high-mounted, stretched rear lamps and by how it horizontally divides the forward-rake rear window into two. When illuminated, the tubular LED brake lights and the central LED hi-mount stop light form a single bar of light running across the tail, giving Eclipse Cross a broad and stable appearance from the rear. A new red exterior color joins the palette, Red Diamond premium metallic paint. This comes from a newly developed painting process that creates a high intensity and brightness. The interior of the Eclipse Cross represents a new design direction for Mitsubishi with a quality and refinement that has never been seen before. The cockpit style interior wraps around the driver for a sporty feel. Everywhere the driver looks and everything they touch is of the utmost quality with no compromise on the detail. This is achieved by the use of high-grade interior materials and the use of piano-black and luminous silver interior accents. Almost immediately noticed once inside the Eclipse Cross is a high-resolution, thin display on top of the instrument panel. This 7-inch monitor is used to control the audio system and is able to connect to your smartphone. Apple CarPlay™1 support and Android Auto™2 compatible, the system can control apps via voice recognition through Google Assistant or Siri. The smartphone link display can also be controlled with a touchpad controller, which allows for tap/swipe operation and ease of use while driving. Another new interior feature for the Eclipse Cross is a full-color Head-Up Display (HUD) that provides the driver with real-time vehicle information. The system consists of a full color LCD display that is mounted just beyond the steering wheel and close to the driver’s line of sight, allowing easier driving by minimizing the change of eye focus length. HUD provides driving information and critical safety messages to the driver, such as: speed, cruise control setting, Forward Collision Mitigation warnings, Lane Departure Warnings and paddle shift gear position. The HUD system is standard on SEL models. The display includes an up/down switch that allows the driver to lower the display into the dash if desired and brightness and height adjustment switches. In the back of the Eclipse Cross, heated rear seats are available (SEL Touring Package). A first for Mitsubishi, both the left and right rear seats can be heated with the push of a switch mounted on the back of the floor console. The rear seats also offer multiple seating adjustments to accommodate for passengers and/or cargo. The rear seat back angle has nine reclining positions and can slide forward-backward up to nearly eight inches to balance passenger comfort and cargo capacity based on needs. Also new for the brand and found in the Eclipse Cross is a panoramic sunroof with dual-pane, large power sliding glass panels (available on SEL Touring Package), with both tilt and slide capability. The front panel can open up to 17 inches. MITSUBISHI CONNECT provides vehicle owners with a safe, secure and more personalized driving experience. MITSUBISHI CONNECT is provided through a simple subscription-based service comprised of an embedded Telematics Control Unit equipped with a 4G LTE cellular modem and GPS capability that operates on a cellular network and is factory-installed within the vehicle. Two in-vehicle buttons connect the vehicle to a call center – one being the SOS Emergency Assistance button and the other an Information/Roadside Assistance button. The Safeguard services package within MITSUBISHI CONNECT includes Automatic Collision Notification, SOS Emergency Assistance, Information Assistance, Roadside Assistance, Stolen Vehicle Assistance, Alarm Notification and Mileage Tracker. The Remote services package include Remote Climate Control, Remote Door Lock/Unlock, Remote Horn, Remote Lights, Car Finder, Vehicle Settings, and Parental Controls (Geo Fence, Speed Alert and Curfew Alert). MITSUBISHI CONNECT will be available for the first time in the all-new Eclipse Cross. Eclipse Cross comes standard with a 1.5-liter direct-injection turbo power plant that offers a compelling combination of drivability, performance and efficiency. This new turbo technology provides both strong torque and better fuel efficiency with 152 horsepower at 5,500 rpm and 184 lb-ft of torque at 2,000 rpm. It features advanced technology such as sodium filled exhaust valves to maximize performance and efficiency and the torque is greater than 2.0L and 2.4L engines in other Mitsubishi products. This new turbo motor used in the Eclipse Cross boasts a quick acceleration response for confident driving and features a flat torque curve at very low rpm. The engine has been refined to provide a smooth acceleration feeling from low to high speeds. While providing power and response, the new turbo engine features tremendous efficiency as well. 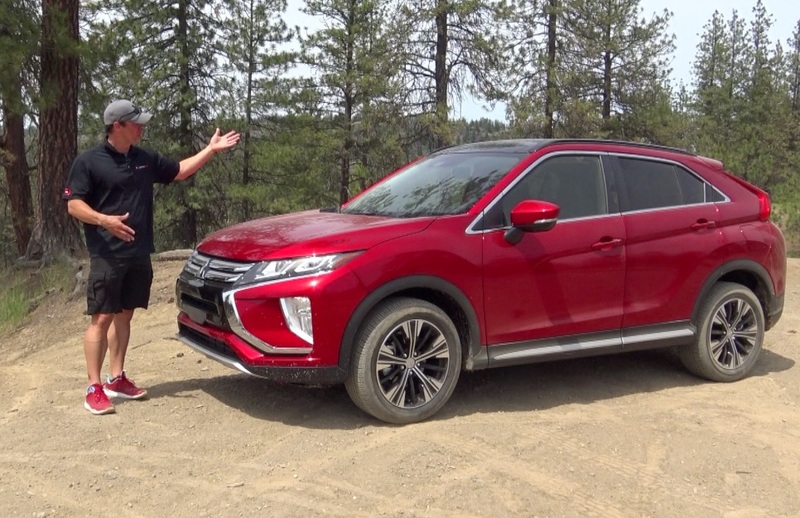 When Mitsubishi was conceptualizing a new CUV, one of the most important factors the product planning group implemented was driving performance – particularly Super All-Wheel Control. The Eclipse Cross is equipped with Mitsubishi’s proprietary, advanced S-AWC (Super All-Wheel Control) system, which enhances both straight-line stability and cornering performance by precisely controlling the torque supplied to each of the four wheels. The S-AWC system is an integration of the vehicle dynamics control system that monitors each component around the 4WD system, including: Active Stability Control (ASC), Anti-lock Brakes (ABS), Active Yaw Control (AYC) to distribute driving torque to the rear wheels and between right and left wheels by additional brake force and the electronically controlled 4WD system. The system uses braking to control the supply of torque to the left and right wheels for improved stability and control. It’s based on the same principles as the S-AWC systems in the Outlander and Outlander PHEV, and builds upon Mitsubishi’s legacy of all-wheel control technology. The S-AWC also uses an advanced sensor monitoring system to detect driver and vehicle behavior. Sensor information is gathered from steering angle, wheelspeed, engine torque, T/M gear ratio, yaw rate, longitudinal/lateral acceleration and brake pressure. Three driver-selectable modes are available (AUTO, SNOW, GRAVEL) to enhance the S-AWC performance and logic depending on the driving conditions. All of these components make up the S-AWC system, which is far more advanced than a simple 4WD system. The S-AWC improves traction in all weather, including snow, rain, ice, gravel and dust while also improving straight line stability and cornering performance. Advanced safety technology supports safer, more confident driving — on the road and in parking lots, day and night. From intelligent sensors that track the vehicle’s surroundings and warns of danger to active driving assistance and solid passive protection, the Eclipse Cross delivers a complete portfolio of advanced safety features. Blind Spot Warning (BSW) and Lane Change Assist (LCA) – This safety feature uses radar sensors in the rear bumper to detect vehicles in rear blind spots, on the right and left sides. An indicator appears in the door mirror when BSW is active and the turn signals are off. When a vehicle is detected and the turn signals are on, an indicator blinks in the door mirror on that side and a warning sound is given to the driver. Rear Cross Traffic Alert (RCTA) – An indicator appears in the combination meter display when RCTA is active. If radar sensors in the rear bumper detect an approaching vehicle nearby while reverse gear is engaged, a warning message appears in the multi-information display, an audible alert sounds and an indicator blinks in both door mirrors. Forward Collision Mitigation (FCM) – Helps prevent a frontal collision or reduce the severity of that collision if it becomes unavoidable. Responds to vehicles and pedestrians via camera and laser radar. Lane Departure Warning (LDW) – The Lane Departure Warning (LDW) system uses an onboard camera to monitor lane position in front of the vehicle audibly and visually, alerting the driver if it detects the vehicle leaving its lane unintentionally. Adaptive Cruise Control System (ACC) – Maintains a selected distance between the vehicle and the car ahead via radar for greater safety and peace of mind. It reduces driver stress especially during traffic jams on highways. Multi-View Camera System – The views from cameras mounted on the front, rear and sides of the vehicle (including a bird’s-eye view) can be displayed in various combinations to help reveal what is in blind spots and help you park. Automatic High Beam (AHB) – These headlights automatically adjust between the brightness levels depending on the surrounding lights. The Eclipse Cross is offered in four models: the base ES, LE, SE and SEL. The Eclipse Cross comes well-equipped in the base ES model, with standard features including: heated power side view mirrors, rear spoiler, color multi-information display screen, high-contrast meters, Bluetooth wireless technology, steering wheel audio and phone controls, rearview camera, cruise control, automatic climate control, power door locks and windows, seven airbags and anti-theft alarm. The starting MSRP for the Eclipse Cross is $23,2953. From there customers can choose the unique appearance Limited Edition (LE) trim with black 18-inch alloy wheels and unique black color exterior accents. The LE trim also includes the 7-inch smartphone link thin display audio system with Apple CarPlay™ support and Android Auto™ compatibility. Moving up to the SE trim includes features such as BSW, RCTA, LCA, heated front seats, Fast-key passive entry with push button start, electronic parking brake w/auto hold, MITSUBISHI CONNECT with 2 year safeguard and remote services trial, 18-inch two-tone Alloy wheels, and silver, chrome, and gloss black exterior styling accents. The SEL trim comes equipped with additional features such as leather appointed seating surfaces, LED headlights, Head-Up Display (HUD) and the Multi-View Camera system. A touring package available on the SEL trim includes the dual-pane power sliding panoramic sunroof, 710-watt Rockford-Fosgate® premium audio system, advanced safety technology (FCM, LDW, ACC, AHB), and heated steering wheel and rear seats.